Suffering from constant teeth and denture problems? If a tooth is severely damaged, broken, has advanced gum disease or is already lost, a single implant is the most natural way to replace it. 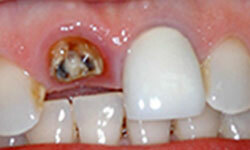 When a single tooth is replaced by a dental implant, adjacent teeth are not touched, prepared or altered. This method maintains the structure of the bone and gums, preventing the jaw's bone loss, while providing excellent function, cosmetic looks, speech and health. When several teeth are severely damaged, broken, have advanced gum disease or are already lost this is the most natural way to replace them. 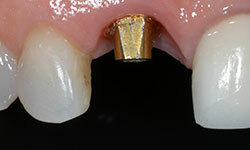 As with single implants, adjacent teeth are not touched, prepared or altered. Multiple implants offer excellent function, cosmetics looks, comfort, speech and health. People who experience chronic problems with their teeth, smile, health of their gums and mouth, or have lost most or all of their teeth, can benefit greatly from this procedure. Aside from relieving the constant pain and agony associated with these problems, we can restore the patient's bite and preserve jaw bone, gums and facial support. Implants provide excellent function, cosmetics looks, comfort, speech and health. Once done they will look like real teeth and function like them too. need for distasteful denture adhesives. There is no longer the need to use "glue"
facial tone. They can reduce or eliminate bone atrophy, which causes "shrinkage"
disturbing the occlusion (bite) and causing joint problems. Yes, implants have been in existence for at least twenty-five years. For the last ten years success rates at many treatment centers has been very high. Few forms of medical, orthopedic or dental treatments have such high success rates. In some cases, the implants can be placed in the jaw bone and can receive a crown at the same time. In other cases, implants are placed in two phases. Phase one: using accurate surgical techniques, an incision is made in the gum tissue and implants are placed into dimension-controlled depths and widths in the jaw bone. The gum tissue is then closed and the healing phase begins. A period of 3 to 6 months is necessary to form a strong base. Phase two: new teeth are placed on top of the base structure. Initially you may feel implants are expensive. However, they last longer and look more natural than dentures and partials. Implants last for years with proper care, and they are a good investment for your health. Independent surveys of implant patients showed that they felt the investment was worth every penny and would do it again! Each case is different. After a complete examination at our Bethesda dental implants practice, I will determine your dental needs and the best treatment for you. You can then ask for cost and financial arrangements. You can e-mail us at drmazza@mazzadental.info or call our office in Bethesda at (301) 986-0025 to make an appointment for a half an hour free consultation. At our Bethesda dental implant center we strive to provide our patients with stress free and comfortable dental services. Our office will give you proper medication to reduce your discomfort so you feel little to no pain. You are asked to be picked up by someone after your treatment is completed. You can get implants when you are a mature adult in your seventies or eighties. 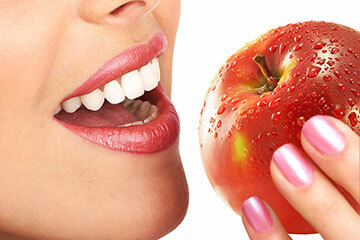 Good health and adequate bone is needed to make you a candidate for implant. If you received your dental implants in Bethesda at our dental practice we provide you with an easy to follow home care routine. Professional cleaning visits are also required. Every 3-4 months you need a routine cleaning, re-care treatment and an evaluation.